Woo, I can’t wait to read it! The title is very eye-catching; “Going Rogue”, it just really draws you in. Or it could be that I’m secretly still obsessed with Palin even though her political career advancements, unfortunately, seem close to nil. Yeah, that could be it too. I have a feeling this is going to go down in the books with the Joe Wilson saga as a story that was talked about far too much. I realize it’s not okay to say make a poll asking if anyone should be assassinated, and chances are the person that made the poll realizes that too. It was surely meant as joke, though I guess the secret service should probably check it out; better safe than sorry. I just hope this doesn’t turn into the left’s latest “hate crime” to whine about. Newsflash: white people can also be assassinated. I swear, if he does I will chalk him up as being the worst president in our nation’s history. It wasn’t that long ago when I was in school, and had anyone told me I’d be attending school for 3 extra hours every day, I’d probably just have dropped out. And that’s saying something because I liked school. There were would be major fallout if this was changed. And by the way, I was kidding about the worst president ever thing, though he would rank up there pretty high……………… but that’d be even without the extra school hours. I’ll try the instant coffee, but I’m probably not going to like it. The last time I had instant coffee I was extremely to close to expelling my stomach cavity; if that’s possible. It was Folgers and it was re-pul-sive. Additionally, I find Starbucks to be vastly overrated. What’s the big deal about late-night profanity? Honestly, I didn’t even notice Jenny Slate’s slip-up on Saturday Night Live. I don’t think it’s that big of a deal, either. We all make accidents and that was certainly one. I don’t condone the usage of profanity, but it certainly isn’t a big deal that the f-bomb was accidentally dropped in a skit that revolved on the word “friggin'”. Simon Cowell may bring ‘X Factor’ to U.S.
I’m all about a good reality show, but I think this may be overkill. If the U.S. version of The X Factor is too similar to American Idol, both series will surely suffer. On the other hand, American Idol all year really wouldn’t be that bad in my opinion. Barry Fail- All the Obama News That You Need: Check This Out! Barry Fail features articles from Ace of Spades, Neovatara, Yid with Lid, and many more great blogs. If you want to make your web browsing experience much easier, check out BarryFail.com today! To visit Barry Fail, click here. To view all winners of the Check This Out! Award, click here. What do you think of the video? Leave your comments below or send an e-mail to theconservativejournal@gmail.com. Don’t forget to bookmark The Conservative Journal and sign up for the RSS Feed and the daily e-mail newsletter. To read my full opinion on the speech, click here. This speech made by Obama was still riddled with holes, even though he did make some good points. Healthcare is broken, but this is not the way to fix it. Obama did a good job tonight of combating lies and explaining the truth behind this bill. Let’s hope that some good will was generated on both sides of the aisle toward action on this issue. President Obama gets FIVE magic carpets out of FIVE. I believe, however, that his speech was not effective. Sadly, I think the American people are so jaded by Obama’s masterful rhetoric that his speeches don’t really mean anything anymore. I, perhaps because I’m a staunch supporter of his agenda, can laud the speech because its content was perfect, but it didn’t tell us anything new. Watching the masterpiece political theater of a Presidential address to the joint Session of Congress, I was struck when I suddenly realized that the President and his two closest successors were sharing the TV frame. 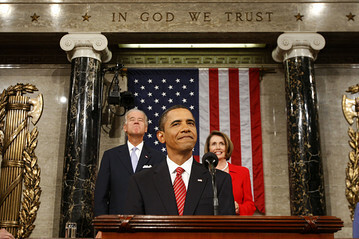 President B. Hussein Obama, Joe Biden and Nancy Pelosi shared one stage tonight for the whole healthcare show. It was 3 Stooges on one stage. So many things not to like, but the individual mandate is the most noxious of all. If the government can tax us simply for existing, there is nothing it cannot do. The President’s speech to a joint session of Congress failed to move the health reform ball closer to the goalposts. It was a pretty speech, but then, so are all of Obama’s speeches. Pretty words can distract and subdue and that’s what we can’t afford right now. His speech IMO was a huge waste of time shrouded in BS. Let them show us that they are capable of doing something right before they lead us into an even deeper chasm. Nothing requires you to change what you have. But nothing is stopping your employer from dumping your plan and forcing you onto the public option. Nothing but nuance, kids. This is good, it’s about time that President Obama took the initiative to own the “choice” argument, when it comes to the public option. We’ll have to see. I’m not the audience for his speech. The audience was the Democrats in Congress. If he has convinced them, that’s game, set, and match. It’s disgraceful when any member of Congress shows dissension towards the President of the United States. That outburst was the most disrespectful and uneducated action ever. What’s your reaction to the healthcare speech? Leave your comments below or send an e-mail to theconservativejournal@gmail.com. Don’t forget to bookmark The Conservative Journal and sign up for the RSS Feed and the daily e-mail newsletter. Poll of the Day: What Did You Think of Barack’s Healthcare Address? To read my take on the speech, click here.